Armed with more and smarter devices, fans interact with the sport differently than they did four years ago—and brands have a chance to reach them in new ways. Read about the insights every marketer should know for the game on Think with Google. With the World Cup kicking off soon, Think with Google looked at some related search data and trends around this global event. We found that this year, there are more searches for the tournament than the Super Bowl, Olympics and Tour de France combined. The latest YouTube Ads Leaderboard is live, with soccer taking center stage. Nike and Castrol get audiences excited for the upcoming World Cup with innovative ads, and Honey Maid spotlights an inspiring art project. See which ads made this month’s list on Think with Google. way, but there still remains one big hurdle to digital becoming the medium of choice for brands: measurement. This unsexy topic doesn’t win any awards at Cannes, but it is top of mind for marketers and we hear about it from our partners all the time. In fact, according a survey we conducted last year, only about half of marketers consider their current brand measurement metrics effective. Our ultimate goal continues to be offering measurement for brands that is as meaningful as the click has become for performance-driven marketers. I’m incredibly excited to see this start to come to fruition across the industry. Today at the Digital Media Summit, I focused on one of our efforts I’m particularly excited about, Brand Lift. eHealth, the country’s largest health insurance marketplace, has traditionally been a direct response oriented advertiser, but wanted to try a brand-building display campaign. Through Brand Lift, they uncovered a 45% increase in branded searches and a 33% lift in all health insurance-related search terms for consumers who saw the eHealth display campaign. Rather than having to wait until the campaign had completed to find out what drove results, eHealth was able to find out mid-flight, and as a result, expanded their display campaign. Oscar Mayer recently pushed the envelope from traditional CPG creative and debuted this funny, sophisticated ad to promote their bacon. Brand Lift showed that this ad generated a 19% lift in brand awareness (notable because this brand is already well known) and 112% lift in ad recall among those who saw the ad. Perhaps most amazing, searches for their brand increased more than 1000% and searches for their product went up 2000%. Not only did the data validate their bold and risky creative direction, but it also provided some invaluable insights. For instance, lift in ad recall for women was twice as high as for men. And, lift in brand awareness was more than ten times higher for 45-54 year olds than it was for 55-64 year olds. Oscar Mayer was able to adjust their audience targeting and media strategy based on these insights in real time, while the campaign was still running. Having spent my career in digital, working with brands, I’ve seen the barriers to digital branding fall down, one by one. From audience scale and targeting, to creative freedom and flexibility, and now, the ability to measure and act on audience behaviors and campaign performance in near real-time - the needs of brands can finally be fully realized online. As I’ve shared in the past, brands are starting to embrace digital in a big way, but there still remains one big hurdle to digital becoming the medium of choice for brands: measurement. This unsexy topic doesn’t win any awards at Cannes, but it is top of mind for marketers and we hear about it from our partners all the time. In fact, according a survey we conducted last year, only about half of marketers consider their current brand measurement metrics effective. Read the full story on Think with Google. Having a baby is a big event, and many new and soon-to-be parents turn to the web to find out what they should expect when they’re expecting. According to a recent survey, they do twice as many searches as non-parents. With Mother’s Day just behind us and Father’s Day fast approaching, Think with Google looked into the data to see what we can learn from the search habits of new parents. 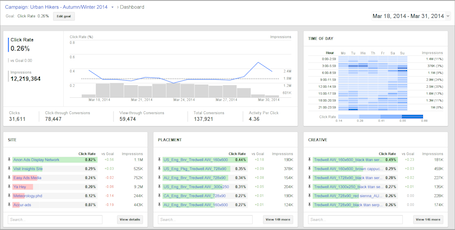 Today we are excited to announce Insights, a brand new, beautiful reporting tool in DoubleClick that provides marketers and agencies with auto-generated insights about campaign performance across channels to help optimize future campaigns. To ensure their messages are seen by the right users, today, advertisers spend hours analyzing data, or digging through spreadsheets to find meaningful campaign insights. It shouldn’t be this way. In today’s constantly connected world, where we reach consumers across many screens and channels, real-time, actionable insights are more critical than ever. However, fragmented tools and reporting are major pain points that prevent this, according to a study conducted with the Boston Consulting Group. Which publisher had the lowest cost-per-action (CPA) in previous campaigns for the same advertiser? What time of day generates the highest cost-per-click (CPC)? How does campaign performance vary by mobile platform? Do certain creatives perform better on certain browsers? Am I maximizing exposure on high-performing placements? Over the coming weeks and months, you will see more and more dimensions added into the tool that will help you surface key insights for smarter campaign management. This new tool includes data across both reservations and programmatic buys. Today, the data is presented together across channels, and in the coming months, we will provide data that is broken out between your reservations and programmatic buys. Our goal with DoubleClick Digital Marketing is to integrate your digital marketing efforts seamlessly, so your teams can effectively manage your cross-channel campaigns. With data that is fresh, de-duplicated, and auto-generated, the Insights tool takes us a step closer to this goal. Insights is available to all DoubleClick Campaign Manager customers, globally, so if you’re still using DoubleClick for Advertisers, ask your account manager about upgrading to DoubleClick Campaign Manager. – a program that provides agencies with the resources, training and support to help businesses succeed online. Over the last few months, we’ve been looking for more ways to recognize agencies’ specialized knowledge in certain areas of digital advertising. This new certification is designed to recognize users with expertise in video advertising on YouTube and the Google Display Network and help them share that knowledge with their clients. Starting today, AdWords certified members of Google Partners in the U.S. can take the Video Advertising exam to earn advanced certification. To learn more about this advanced certification, please visit the Partners Help Center. We’re excited to announce that the new Video Advertising advanced certification is now available to members of Google Partners in the United States – and coming soon to other countries. In October 2013 we launched Google Partners – a program that provides agencies with the resources, training and support to help businesses succeed online. Over the last few months, we’ve been looking for more ways to recognize agencies’ specialized knowledge in certain areas of digital advertising.